My large dog like most others loves garbage and it drives me crazy to have trash all over the kitchen every time I walked in the door. It seemed like he hits the garbage every time I would turn my back. We ended up putting our trash can in the garage for almost a year before I broke down and figured there had to be a better solution. I was amazed when doing research looking for a dog proof trash can, that there were not as many options as I thought there would be. So to save you time, I wanted to list the dog proof trash can that we selected and a list of the other options out there. But, before we get to that, I want to cover a couple things that may help you solve the underlying issues. 5 So, Why Dogs Get Into the Trash? You can place a motion-activated device near your trash can that will blow compressed air when your dog gets closer to the trash can. There is also a type of rug that delivers a small shock when your dog’s steps on it. The environmental punishment is most effective for dogs that have learned to sneak into the trash when their owners are not there. Although the environmental punishment does not cause physical injury, it should not be used with dogs that are naturally nervous or fearful. Say “Leave it” when your dog gets closer to the trash can. When your dog walks by the trash, also say “leave it.” At this point in his training, your dog should know how to look at you for reward than reaching for something that he is not supposed to. Reward it with a treat every time it turns away from the trash and looks at you. Both steps above can work in conjunction together. Combining them with a dog proof trash can works even better. When your dog is unable to easily get into the trash when your not around, it will push the point that there is no reward for him here. 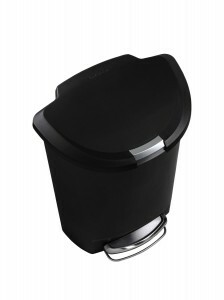 The simplehuman 50 liter/13 gallon trash can is the dog proof trash can we picked for our house. To be honest, the reason we picked this one over the rest is because of price and design. This trash can comes in four different colors, grey which blends in with stainless steel appliances, a brown mocha, black and stone (we went with black). The reason this along with most every dog proof trash can works is that it has a lock on it so you can lock the lid shut. When locked, the lid will not open at all. To open the can, you release the lock by pulling it out (grey part on the lid in the picture). Once unlocked you can either lift the lid all the way by hand or step on the foot pedal. Lifting by hand will make it stay open, stepping on the foot petal will open and close when you lift your foot off. When the thrash can closes, it does so slowly using a built in shock. This stops it from slamming shut. I have read two complaints from the over 500 reviews. The first one is that 13 gallon trash bags are not quite big enough for this can. Other said they have no issues with this. I will say that the Glad tall kitchen 13 gallon bags that we have used for years fit perfect. We get them from our local supermarket. The other complaint is that the can is not heavy enough. Not that it is cheaply made, but moves to easy. I don’t know if these people are use to metal cans or what but it is plastic and doesn’t move any more than our last trash can. To date, our dog has yet figured out how to get in it even though he has tried. It has been a while now and he has mostly given up on even trying. 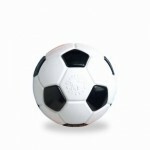 To find this can with free shipping and to see a lot of user reviews you can visit Amazon here. The simplehuman Butterfly can is almost dog proof, it depends on how smart your dog is. 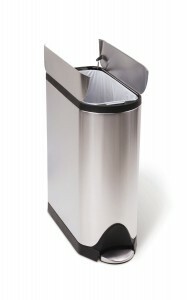 This is one of the best choices for dog owners that want a metal stainless steel trash can. It is a little smaller at 45 liters/12.5 gallons. It is also laid out a little different giving people with less space a good option. The way the Butterfly works is it opens in the middle as seen in the photo. Dogs are not able to push their head down into the trash can or lift the front lid to gain access. If you have a genius on your hands, you puppy might figure out that if they step on the foot pedal (and heavy enough) that they can get the lid open. Also, this one doesn’t have a locking lid, so if your dog is able to knock over this trash can, it will be able to get to the garbage. You can fix this issue with the DIY section below. 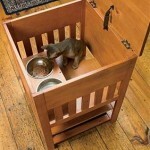 When talking about stainless steel garbage cans, this is about as much dog proof you are going to get. Another upside to this can over the plastic one above is that it has an insert for the bag that slides into the main can. This one has over 80 reviews and 5 stars from reviewers and there is a reason for that. To see all the reviews on the stainless steel butterfly style, check them out here. Last but not least is the slim style by simplehuman. This is the top two combined in one. Working like our first dog proof trash can, this one has the locking lid to keep dogs out and the slow lowering lid. It is the thin style like the butterfly above that can fit in small spaces. This can is made out of plastic and comes in grey, black and white. It is also the smallest of the three at only 40 liters. The upside on this one is again price over stainless steel. It makes a good fit for people that need to save space, doesn’t want to spend a lot of money and requires a locking lid. Being the same brand, I would bet it is made just as durable as the 13 gallon above, just shaped differently. The one down side is the slim design along with being plastic, is it may be easy to push over for your dog. If you are not wanting to purchase a new trash can with a locking lid, this option may be best for your. You can make the middle option above into a stainless steel dog proof trash can. So, let DIY dog proof your trash can. You will need good quality baby straps like the Secure Home by Jessa Leona Straps. Inspect your trash can and find where you want to place the strap. Clean your trash can where the strap will go. It important to remove all grease and let dry completely. Install the heavy duty straps in place. Make sure to install where you want. The 3M tape will be very sticky and once on, it cannot be removed. Let bond overnight before using. Good job! You now have a DIY dog proof trash can. No matter what dog proof garbage can you go with there are a couple designs I would stay away from. The first is any motions sensor trash cans. It kind of defeats the purpose of trying to keep your dog out of the garbage. The next is any front opening can without a lock on the front. Dogs are very smart and will figure out how to open it. Our dog figured it out in less than a day. Lastly is any swinging lid, this goes without saying but you really do not want a trash can where your dog can just put his head through the top. I also suggest using a training collar to help with the behavior of getting into things like trash and on the counter top. So, Why Dogs Get Into the Trash? An age old question; why dogs get into the trash? The answer is simple dogs were domesticated by humans for several thousand years. Speculation is that wolves were first captured as puppies or tamed because of their living in proximity to human villages. Why these wolves living near human community? To scavenge our trash for food, of course! In the wild, the wolves can spend several days without eating. They do not always flourish in hunting big game every day. We can consider the food we throw away to be garbage, but for some dogs, this is just food-ripe, stinky, aromatic food! Dogs love the smell of all the old food and everything that could expect in a trash bag. This is an interesting and exciting bouquet aroma for them. Another reason why your dog loves trash is that the first time it was in the trash, there were probably an excellent tasting leftover meat and some other doggy delicacy and may be your dog remembers how good it was. Don’t forget dogs are creatures of habit and any good dog may hope of hitting a jackpot again next time it is in the trash. Some dogs have developed a habit of digging in the trash. Sometimes they find good things to eat or fun things to chew. When they are so busy in sniffing out an interesting scent, they can disperse garbage throughout the house. Trash can be similar to a dog version of a Cracker Jack box. They know there is yummy inside. Dog owners always go extra lengths to feed their dog’s healthy food. But regardless of a good portion size and a good food choice, a lot of dogs still enjoy digging the garbage for extra pieces. That dogs act out of boredom or are simply scavenging for extra treats, kitchen and bathroom garbage bin seem to have a gravitational pull for our four-legged family members. However, eating from the trash can be more than an unpleasant behavior – it can be very dangerous for dogs in such a way that. If your dog eats paper products – such as towels, napkins and toilet paper, though it will probably not harm your dog, unless the amount consumed is excessive. But dog owners should also consider what kind of substances in the trash paper towel and napkin may contain. If paper towels were used to clean raw or cleaning products, contaminated food, and other chemicals, gastric pain or actual poisoning could occur. Also, there always seems to be a holiday in the corner and each has its own variety of decorations, sandwiches, and foods that can end up in the trash. While consuming Christmas decoration is most likely as risky as eating a Halloween decoration, certain types of objects are mostly dangerous. Tinsel or anything string-like can cause a condition called “linear foreign body”. Which are particularly dangerous because they can wedge and cut the gastrointestinal tract, resulting in potentially fatal abdominal infections. The next danger is consumption of potentially spoiled foods from the trash has a great possibility of causing disease in an animal. Spoiled or raw foods are more likely to cause Salmonella or Campylobacter microbes. Symptoms of salmonella include fever, diarrhea, vomiting, shock, lethargy, weight loss and dehydration, and could end up your dogs in a vet’s care. And lastly of course is bones and things that can poison your dogs like onions. Dogs should never have bones like chicken bones. You can quickly find yourself in an emergency situation. This should be a good reason alone to have a dog proof trash can. As we all know that dogs are by nature sniffers, lickers, and scavengers – and use it sense similar to how we use touch. Not only dogs are attracted to things that smell like a human, but they are also attracted by the smell of blood, feces or decay as they frequently lead to food or even things to play. However, ingestion of diapers, tampons, and related items can easily cause an obstruction in your dog’s intestine. So you should do your best to keep your dog safe and away from trash. «Dog Proof Fences: Is an Underground Invisible Fence Right for You? 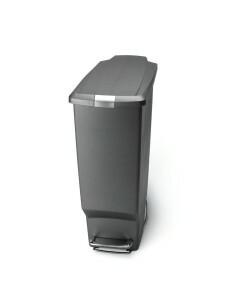 I bought a Simplehuman Butterfly Metal Step Trash Can and agree it’s a great choice for dog proof trash can. My 80 pound dog got into a number of other trash cans but never this one. Besides being a dog-deterrent, the product has attractive clean lines and is hands-free–unlike most locking varieties. Been using the first trash can for almost a year and love it. My dog would get into the trash slimiest every day. It seemed like we were cleaning up garbage daily. Since we have had this trash can, our lab has yet get into the garbage unless we forget to lock it. We got the metal butterfly trash can. So far our dog hasn’t been able to figure it out.